The quiet, cold mornings that these fall days bring–starting oh so much later than they used to and feeling oh so much sleepier when they are accompanied by that beautiful grey-blue cloudiness of Oregon’s rainy days–are perfect for lingering. With warm cups in hand, the farmer and I sit and talk in the early hours of the day, giving breath to all the ideas that this slower time of year brings to our minds. As soon as that whirl of summer truly comes to an end, and the feeling of autumn reaches not only into the day length and the weather, but into our bodies, shifting our primary focus from body and movement to mind and stillness, we start truly planning for the next season, as well as the next few years and the indefinite future. One of the things we have been thinking about is mushrooms. The farmer has been trying to cultivate them for many years. Some logs we inoculated never did anything, some we found were already inoculated with a different fungus which grew instead of the ones we intended, and some we have just been waiting on. 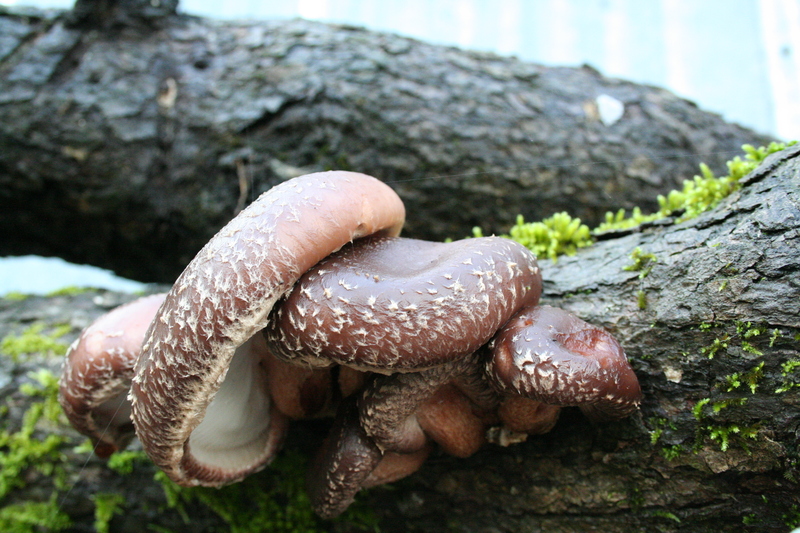 Finally, with the early rains of this fall, we are seeing our shitake logs start to fruit! That, along with the fun we had selling wild-harvested chantrelles and lobster mushrooms gathered by a friend these last few weeks, has really gotten us excited. 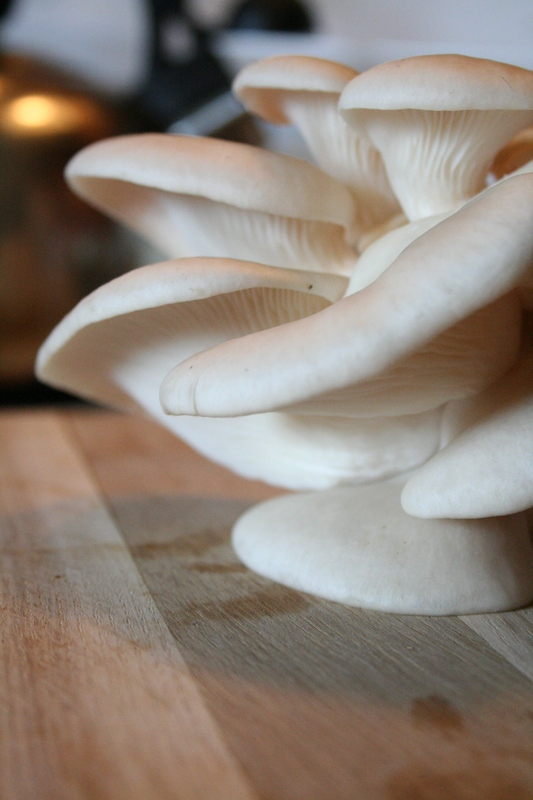 The farmer has started some elm (a kind of oyster) mushrooms, and really wants to try for some more. I am a bit more hesitant, since we have already thrown a lot of money at the mushroom thing, and so far we haven’t seen results. For now, we will see how the shitake and elm do. We do love cooking with mushrooms, and they are fascinating to cultivate, worlds away from growing vegetables. And folks at market love them too. Some things, I am much more sure of investing in. Being able to sell fruit this year was also pretty exciting. Some of our apple trees were the first thing we planted on the farm, a few months before we even moved out here. As we start to get more and more fruit from these early plantings, we feel really pleased with the time and money invested in them, and have been looking to see what we need more of now. 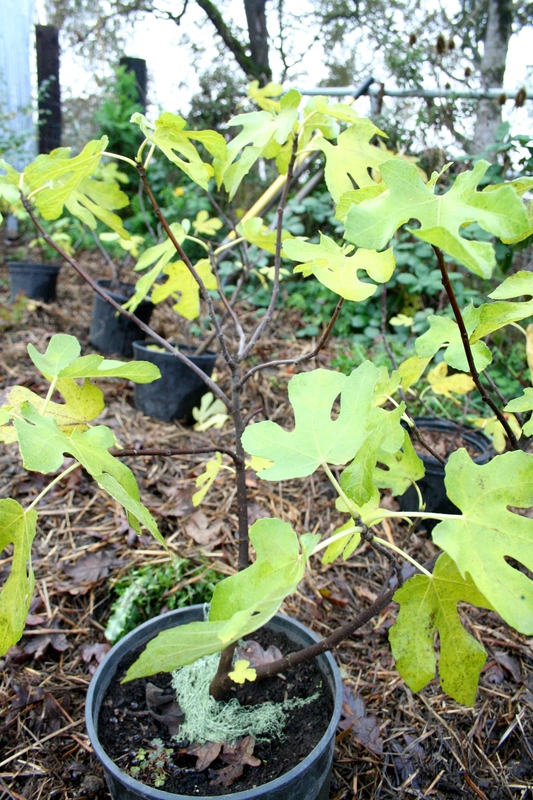 Our lone fig tree desperately needed some friends, so we picked some up from another market grower to round out our fig plantings. And looking to the future, we have all kinds of things to dream about and start work on this winter. These pinot grapes were gifted to us by our friend Felix of Carlo and Julian in Carlton. For the last two years, we have gleaned wine grapes with another good friend and tried our hand at making wine (and yummy vinegar). 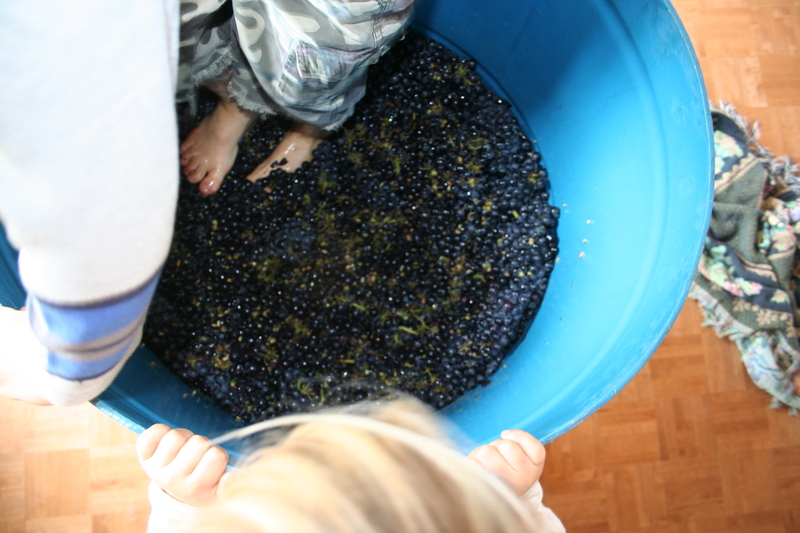 Last year we gleaned pinot grapes and got a decent amount. This year, the guys gathered chardonnay, and we only got a little since the grapes had a late season just like everything else. 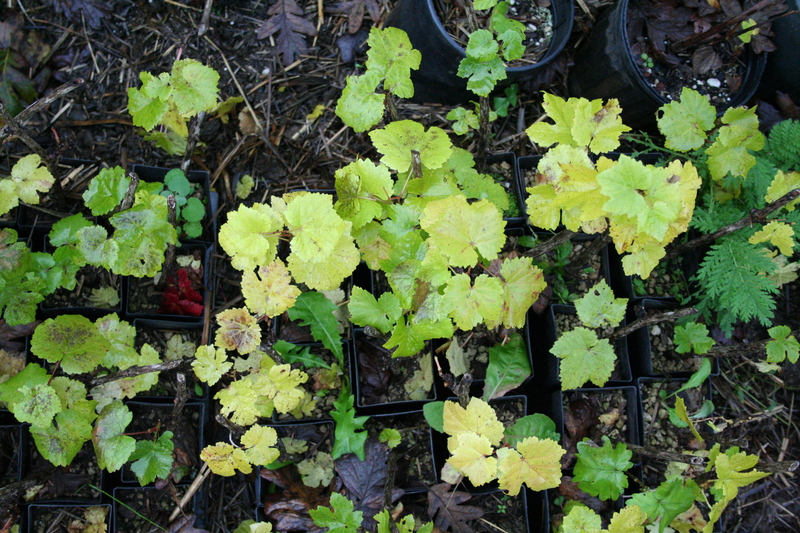 We have a lot of these pinot cuttings–we would never use them all for wine since we would still just make it for ourselves. In a valley with some seriously good winemakers, we certainly wouldn’t move beyond amateurs in that realm. But some other specialty products might come out of these grapes if that project manifests. We would place them in our far-south field which is a pretty steep, south facing slope. A little out of sight-out of mind for now, and a long way from our water. The farmer wants to build some ponds along the small seasonal waterway that runs down the middle of that field to irrigate from. Definitly one of those farm projects in the future category, but fun to plan in our heads and dream around on these cool, slow mornings. And probably the most exciting project that is in our near future folder is the renovation of our turn of the century barn into our new home! A GIANT project…especially for our busy farmer. But we have toyed around with the idea for a while, and have now really committed to it, drawn layouts, and started slowly moving on it. There is a ton to do, the least of which is to build a new chicken coop and either another, smaller barn for the goats and pigs or a cozy spot for them each under our quite large machine shed. We plan on this being a two year project, and plan on taking the greatest care with the materials we use. The wood in the barn is beautiful, and we will make use of it and the oak we have had milled from the two old white oaks that have fallen since we moved onto the property, as well as other northwest wood milled by one of our good friends. For many materials, we will have to wait and watch for them to find their way to us since we don’t want to make Lowe’s or Home Depot too much a part of our dream home if we can help it! And these projects are really just the tip of a very large to do list. We tend to prioritize the things that need to be done for next year first, the things that are most important for the business that we are growing. 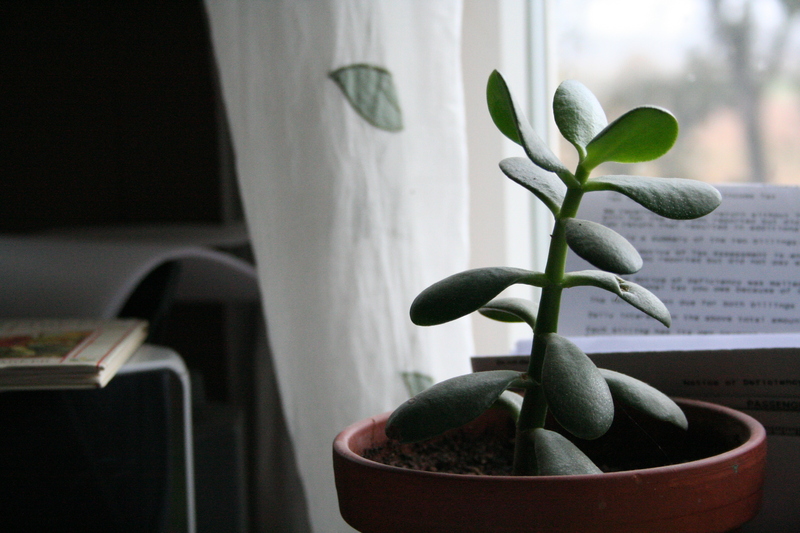 Projects like the grapes, and house projects have generally taken a back burner. And although there have been (many) moments when I wanted to scream about this or that in this 1970’s manufactured home the property came with, it has been the center of living for a very vibrant family for the last four years, and this alone has imbued it with life. 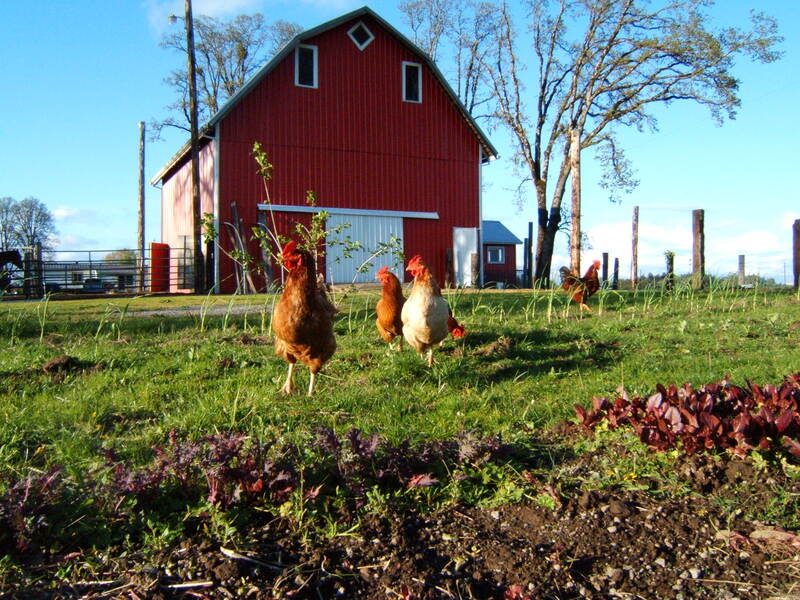 We give it attention when we can, and have worked to make it a “home” the best we can while starting the farm business. It is nice to have gotten enough of that work under our feet now that we can begin to dream more about the “home” we will watch these little ones grow into adults in. When we first came to this piece of land, we drew out a plan for the entire 14 acres. Although the house wasn’t in the picture since we didn’t know where it would be yet, all of the pieces are slowly coming together, mostly how we saw them when it was bare and brand new to us. As a young, married couple with just one small babe in arms, we began to dream of this place. Back then we spent colder and crisper and more golden mornings in Nebraska with our coffee in hand imagining this. And then, we found ourselves in our dream! Even though we plant seeds in the springtime, the real beginnings take place here, in the fall and winter, when we give thought to all the things we want to grow in this world each year. This is the perfect time of year to let your mind roam, let possibility take hold.